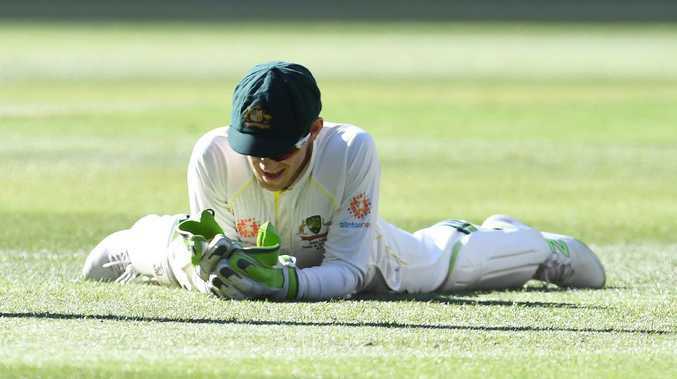 Tim Paine is trying everything. AN Indian go-slow on a wicket destined for the scrap heap conspired to cook Australia's bowling attack in a plan designed to put the MCG Test and potentially the next one in Sydney beyond the home team's reach. 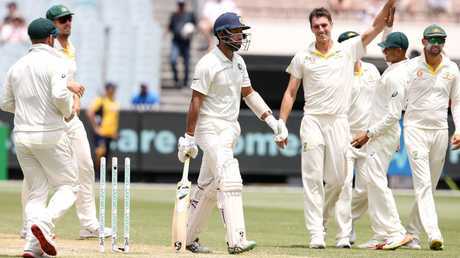 Confirmation from Cricket Australia chief executive Kevin Roberts that it was time for a "regeneration" of the dead MCG square came as little relief to the Aussie attack forced to toil again for 80.4 day two overs in baking heat as India put on the brakes. Sloppy Australian fielding in the final session, when three chances went down off Nathan Lyon's bowling, added to the misery for the home team which began the day with coaching staff "depressed" by the lifeless strip. Indian captain Virat Kohli declared 30 minutes before stumps with his team 7-443. Australian openers Aaron Finch (3) and Marcus Harris (5) then survived six nasty overs to finish 0-8, with Harris copping another blow to his helmet from Jasprit Bumrah. But their side is staring down the barrel of its own monster batting effort to save the bowlers from having to fight the pitch again. Another poor rating is likely if the mood of the match doesn't change, which would put the MCG within two demerit points of losing the right to host any international cricket for 12 months. Cheteshwar Pujara was eventually dismissed after reaching his century. The new rules came in to play in January but if they had of existed a week earlier, CA could have been looking for a new Boxing Day host in 2019. "We need a sense of urgency in terms of the regeneration of this wicket square," Roberts said amid calls to scrap all the pitches and start again. Comparisons to last year's epic yawn fest against England have been ever-present over the first two days. But that turf bore featured more runs (519) and wickets (12) across the opening two days than this year's Boxing Day bomb. The Indian innings was the longest at the MCG since 1983 and Australia will need to bat for a similar amount of time to snuff out any chance of India taking a 2-1 lead to the SCG. Entertainment A bevy of stars have landed in Cannonvale, and tickets to their cabaret-style travelling circus are on sale now. Whats On Got a soft spot for tattoos and rockabilly? This one's for you.